In Forest and Field: He Lived! 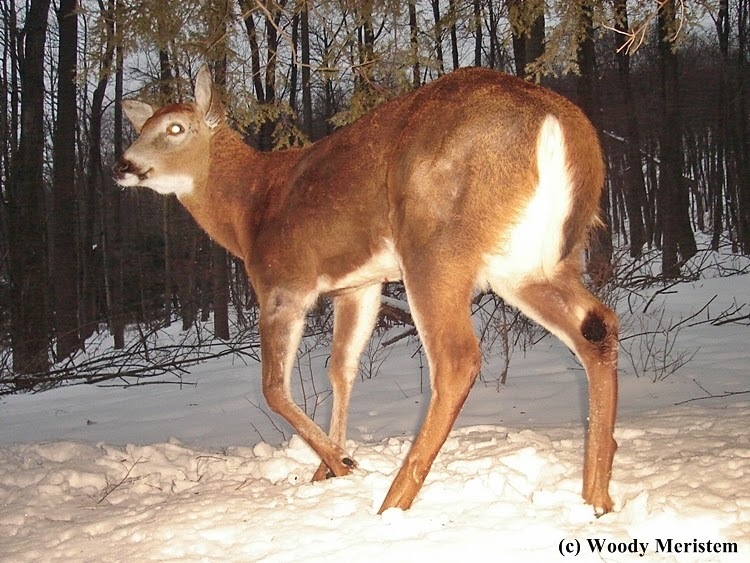 January 2014: the camera traps above the house photographed an injured white-tail buck that may have been wounded during deer season or hit by a vehicle. His left front leg seemed to be broken; he had trouble walking and was apparently unable to put much weight on the leg. Photos and a video from January 2014 were posted here and here. 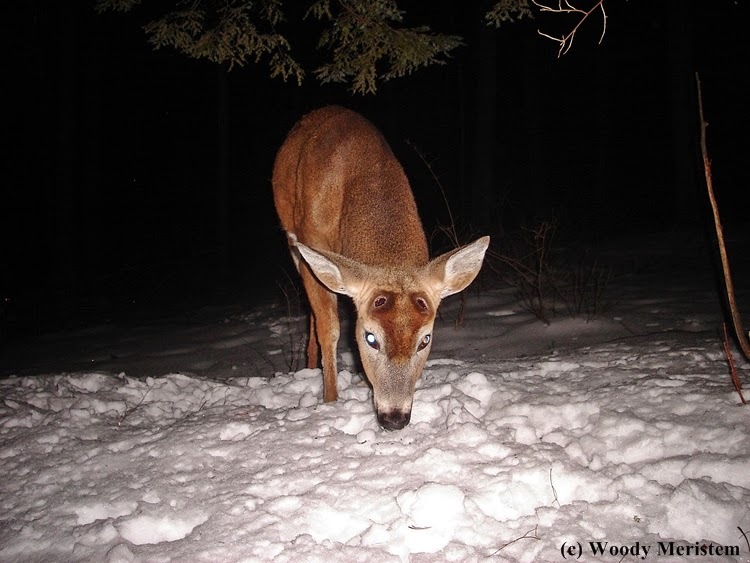 Between last winter’s low temperatures and fairly deep snow we assumed that the buck probably wouldn’t survive and that he’d end up feeding the scavengers: bears, fox, coyotes, ravens, crows, vultures and insects. 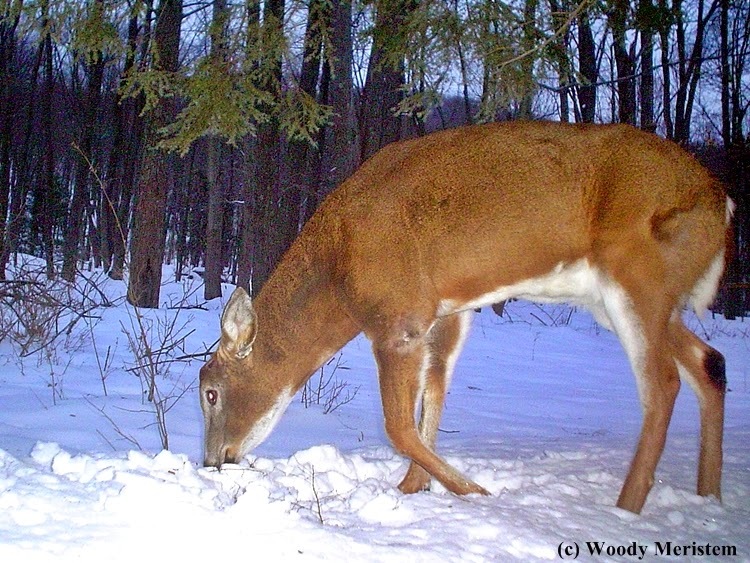 That opinion seemed to be confirmed when we didn’t see the deer again nor did the camera traps get any photographs of him during the following year. 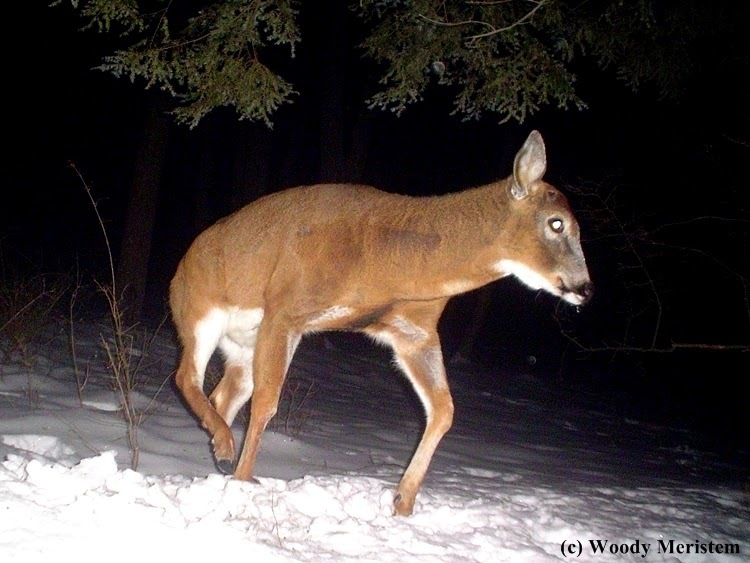 Where had he been, how far had he wandered, how did he fare during last fall's rut? Questions, questions. 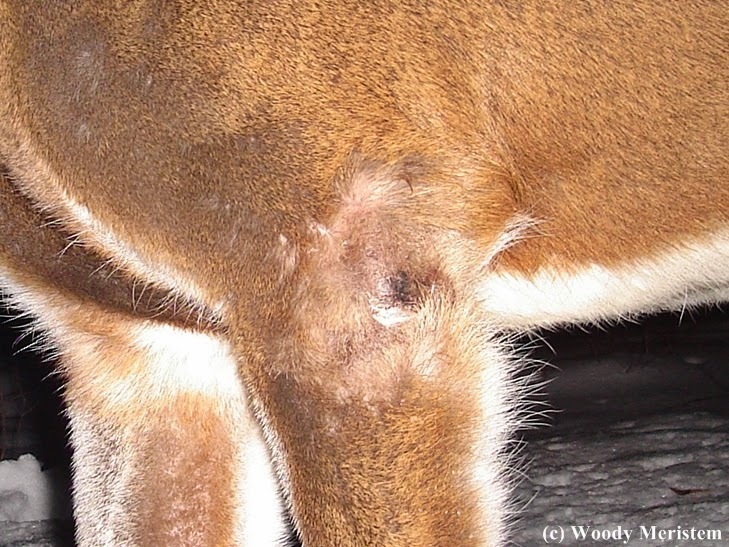 In a head-on photo the places where his recently shed antlers were attached (the pedicles) are easily seen. The pedicles would have been bright red and raw looking when the antlers first dropped. By the time he appeared in front of the cameras the pedicles were scabbed over. He lived! And has survived for over a year in spite of a significant injury that resulted in limited mobility – they’re tough! They ARE tough. Very interesting to see those photos, Woody, and to learn that the old boy survived. I once visited the taxidermy studio of the van Ingen brothers in Mysore, India. They had a huge enterprise, but the most fascinating thing was a collection of hunters trophies from the days of the Raj -- they were skulls of big game species that had recovered from horrible gunshot wounds. . . healed brain cases and mandibles that had been shot off. One tiger skull had the broken brow tine of a sambar stuck in the eye socket. Bone had sealed it in place. Years ago a fellow showed me the skull of an eastern coyote -- it had apparently been shot in the head some time previously since the injuries were totally calcified and healed. The bullet seemed to have entered just below the eye, taking out several teeth and then exited through the lower jaw on the opposite side breaking the jaw and removing more teeth. That animal recovered and survived until it was again shot again and killed. How it escaped a massive infection and managed to feed while it was recovering is the $64 question. Amazing powers of recovery, and I'm not against hunting, but I hate to see animals suffer. He must be tough one to survive the injury and the winter.. Awesome photos! Thank you so much for linking up and sharing your post. Have a happy Valentine's day weekend! Wow, he's got some stamina eh. And you've captured some super photos of him. Let's hope that his luck holds out. Great captures of this tough and fortunate buck. Nice captures and love the fine sentiment! Hope this guy is okay. I'm so glad he made it! Glad you got to see the images you shared with us, and have that confirmation. How amazing, what a strong and beautiful survivor! They are tough animals for sure. By the way I believe you are the fellow that sat with my nephew and myself this past fall up on the saddle watching Limpy and his harem of cows one evening. Glad I found your blog.